Drew puts the GeekVape Medusa Reborn RDTA through its paces on a trip to Niagara Falls! Today we’re going to be looking at the GeekVape Medusa Reborn RDTA, a large, premium RDTA tank that promises a ton of performance and brilliant flavor. GeekVape is known for making pretty solid tanks as well; both RTAs and RDTAs. But how will the GeekVape Medusa Reborn RDTA stack up? I’d like to say upfront that just because our awesome sponsors send me new products free of charge, it doesn’t mean my reviews will be buttered up. If it’s crap, I’ll call it as it is – there’s no point doing this otherwise. I have a background in machining, so I know what I’m talking about when it comes to quality on things like tanks. Quality control is a huge part of the industrial design process and if it isn’t done correctly, things will almost certainly go south, usually very quickly. You CANNOT scrimp on this aspect of production; the results can be extremely damaging (just look at what happened to Samsung’s Galaxy Note 7 – and they’re a multi-billion dollar company). If the machining and quality of a product aren’t on point, do not expect me to gloss over it. That simply will not happen. So yeah, I might be a little rough at times, but only if the product definitely deserves it. That’s how companies improve and continue to earn business after putting something out that may have some flaws or potential improvements. A business that can’t continuously improve their products probably won’t last anyways. With all that out of the way, let’s talk about the Medusa Reborn RDTA by GeekVape. A huge thank you to the folks over at SMOK STORE who sent this out to me! The Medusa Reborn is a fantastic piece of equipment, and the machining quality is nothing less than superior. The threads are incredibly smooth compared to the clones I usually purchase, and the fact that they use flat head grub screws was just icing on the cake when it comes to the design. The post holes are enormous, you can fit MASSIVE coils in there and secure them with zero problems. In addition to this, the holes are also staggered which means it is a lot easier to throw coils in without bending the leads too much. And this is definitely a good thing, because small bends in the wire, especially sharp ones, can impact the ramp up time. And you definitely do not want that. 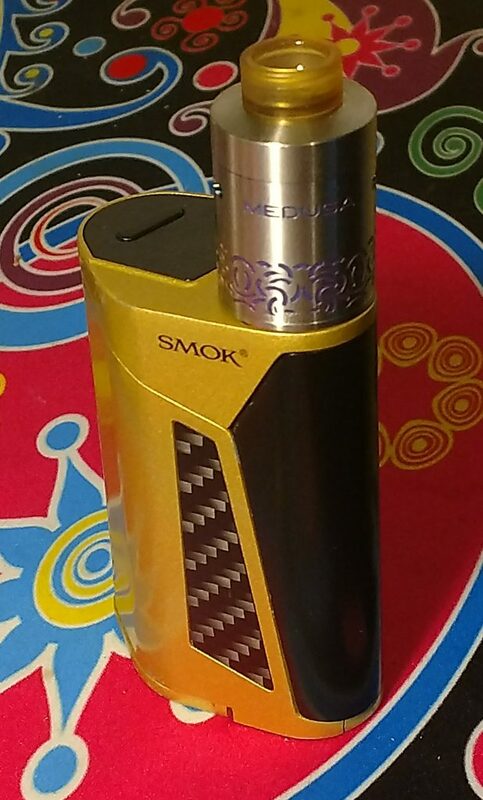 Ramp-up time on the Medusa Reborn RDTA is fantastic, largely thanks to its beautiful, gold-plated deck. So how quick is QUICK? I pulsed some dual-framed Clapton coils (around .17ohms) at 70 watts and got almost an instantaneous glow! Usually, I run my Smok Alien on hard mode too, but with this guy… well, you definitely don’t need hard mode. As far as build space goes, you can’t fit super-large diameter coils in there, unfortunately, but that’s not a huge problem in my book. You do have a lot of room to play with, though, as the AFC has a conical feature in it, which means more room on the way up. Oh, and did I mention its squonk compatible? Well, it is! And GeekVape even includes a squonk pin inside the standard kit. The flavor is pretty damn good on this, and I usually rock a TFV12 at like 200 watts on the daily so I’m a fan of the warm dense clouds. The Ultem drip tip is fantastic; it’s the perfect size for my mouth and, best of all, it never gets hot. I will say this about the flavour, though: it isn’t QUITE as good as I was expecting. It’s easily as good as any standard sub-ohm tank you can name, but for an RDTA, well… I was kind of expecting a little bit more. It’s still very good, just not up there with the GOONS and GAIAs of the world. As far as juice goes, this guy holds 3.5 mL, which is a decent size for an RDTA. The GAIA RDTA only does 2ml, for instance, and that was Drake’s only criticism of that tank. The extra 1.5ml means you have more time in between refills, though not enough time to get bored of an E-Juice flavor. Pound for pound, and because I ran it at a high wattage, I probably had to refill the Medusa Reborn RDTA every few hours or so. I took it on a little hike to Niagara Falls this past weekend as a true test of whether it would leak, and if the juice capacity would do me justice (i.e. hold up for a few hours). It doesn’t leak – not a bit. And it did last for a good few hours with moderate vaping. 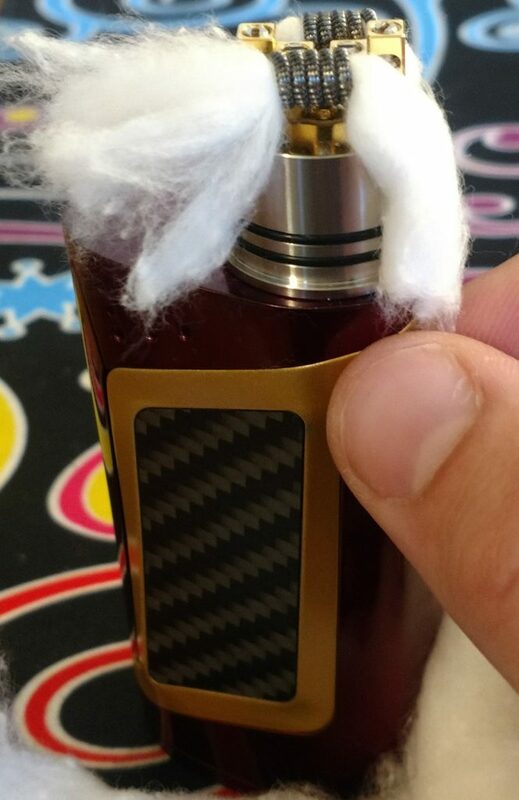 The conical feature below the coils also helps prevent juice from leaving the juice well when you tilt it a bit to hit it. All in all, this is a very well designed RDTA and it is super easy to build on. The only thing I’m not fond of is it just doesn’t have a lot of air flow. In addition, only putting the holes on the top (while much more practical on an RDTA) takes away from the flavor and density of the vape. 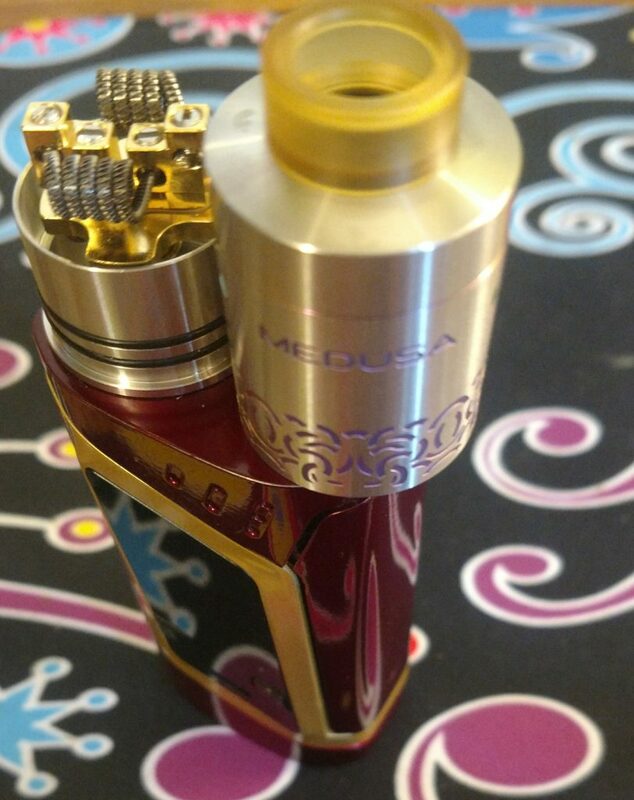 Alrighty then, those are my thoughts on the GeekVape Medusa Reborn RDTA! If you like running RDTA’s this one is definitely worth picking up.